Earlier this week, I sat in my parked car and watched as a man in a cherry-picker worked to remove the remaining signage from the 88,000 square-foot building I was facing. Another man, on the ground below, looked on as his colleague above tinkered with the hardware that held the remaining lettering in place. By the time I’d pulled up, they were already working on removing a giant blue “G” from the side of the building. The man in the cherry-picker would loosen a few bolts, reposition the bucket, and loosen a few more. It’s slow, tedious work and breezy 30-something temperatures make it even slower. 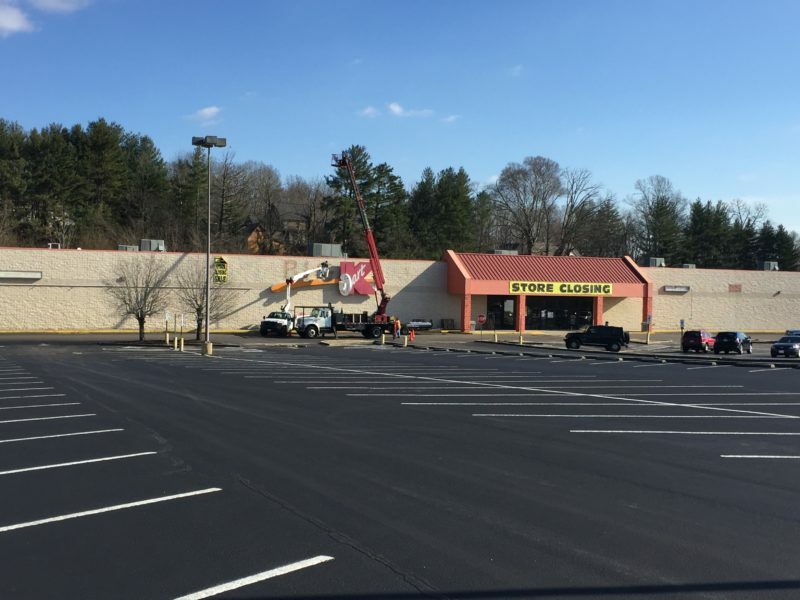 Piece by piece, letter by letter, the BIG K sign was loosened from the storefront and lowered down from the exterior of the now-defunct Cookeville Kmart store. A small group of four or five people braved the cold for a few minutes at a time to watch; their cell phones, in hand, documenting this moment. Were they Kmart employees who were now without a job? Maybe they were long-time shoppers there. Maybe they were simply interested in witnessing the final day of just one of the many Kmart and Sears stores being sacrificed in a sad, too-little-too-late effort to save the Sears Holdings’ family of stores overall. Since first reporting on the announcement regarding the closure of the Cookeville store in November, I have tried to understand why these once-iconic brands are dying (and have been dying) a very slow, very public, and very humiliating death. Up until then, I’d known Sears and Kmart were struggling and the buzzards had been circling for some time. Why doesn’t corporate cut its losses and close up shop? Do a quick internet search for “Sears”, “Kmart”, or “Sears Holdings” and you’ll find there are hundreds of articles and opinion pieces – articles mentioning SHC stock (currently hovering at a dismal $2.38 per share), experts trying their best to predict when, not if, the parent company will fold, and so on. A few articles mention the people – the employees – caught in the middle. SHC corporate has remained tight-lipped on just how many employees were affected by the closures of our local Kmart and Sears stores. Mostly part-timers, a corporate spokesperson told me. Ditto for the Crossville Kmart which is currently in the midst of its own liquidation sale. When the “G” was finally situated in the sling that would lower it to the flatbed below, I felt this strange wave of nostalgia come over me. Now, mind you, I didn’t frequent Kmart all that much in recent years but I couldn’t help but think how sad it was watching this store die. But, some would argue that this store, much like other Kmart and Sears stores, has been dead or dying for some time; even before being officially deemed unsuccessful by corporate. Dated pegboard shelves and tired tile floors have greeted local Kmart customers for years. It’s a common scene at other locations across the country. Modern advertisements and brand displays throughout the store clashed with the 80s- and 90s-era fixtures and signage. While the faces and trends featured on the make-up and clothing displays changed over the years, the face of the store selling that merchandise hasn’t. 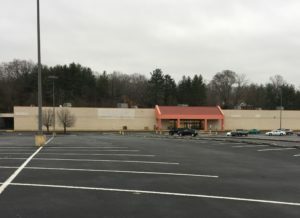 Kmart’s demise, much like that of its stepbrother, Sears, lies in part from a lack of updates to their stores; leaving each store to serve as a time capsule of sorts for their respective heydays. Many shoppers and analysts alike tend to point the finger of blame at online shopping; not just in the case of the decline of Kmart and Sears but other retailers, too. It’s true that online shopping has taken a toll on the traditional brick-and-mortar retail scene; forcing retailers to get with the times and cater to today’s shopper. These days, many iconic names in retail are struggling to stay relevant and turn a profit. Macy’s, JCPenney, Toys R’ Us, Sam’s Club, Gap and Banana Republic have each announced plans to shutter stores across the country in 2018. Amye is the managing editor for the UCBJ and can be reached at amye@ucbjournal.com. Amye Anderson is the managing editor of the Upper Cumberland Business Journal and can be reached via email. Send an email.